The word bicycle was first used in France in the 1860s. In 1869, an Illinois sheriff reported he formed a bicycle unit for his deputies to patrol. In the summer of 1888, the Newark Police Department in NJ established a patrol bicycle squad. 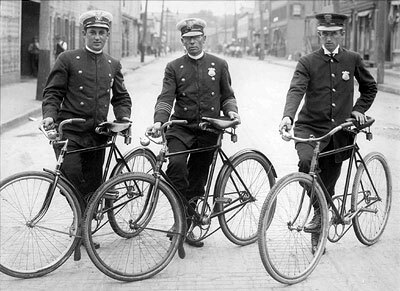 In September of 1892, the police department in Orange, NJ started a small unit of officers patrolling on bicycles. In December 1895, New York City Police Commissioner Teddy Roosevelt started a bicycle patrol unit. The Kent Police Force in England soon followed and reported that they started a bicycle patrol division in 1896. By 1894, cities such as Philadelphia, Cincinnati, Chicago, Baltimore, and the District of Columbia had active bicycle police patrols in their jurisdictions. Even the Fargo, ND police department reported they were patrolling on bicycles in 1898 using Crimson Rim bicycles. 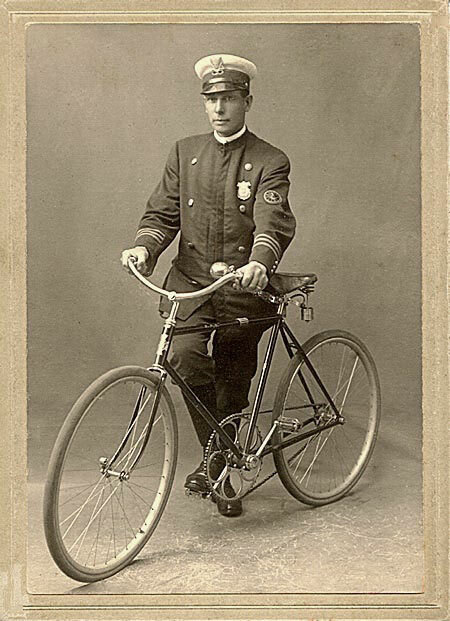 Bicycle patrol was a trend in police patrols until the advancement in automobiles and motorcycles during the first part of the 1900s. Police bicycle units did not fade away completely but the new form of motor transportation was transforming police patrol procedures. With law enforcement policies and strategies of the 1980s geared towards community policing efforts, the bicycle patrol made a comeback. With the national trend of staying healthier, bicycle manufactures started producing products and equipment that met the demand of the modern extreme athlete who wanted to bike off-road and blaze their own trails. Police bicycle units quickly adopted the mountain bike. The mountain bike offered the capability of maneuvering off-road in rough terrain with enhanced durability and performance. Offer the advantage of going where other patrol vehicles cannot. Bicycle patrol has never completed faded from many departments strategic patrol plans since the introduction in the mid-1800s. Several police associations formed to create the bond between bicycle officers and different bicycle patrol units. These organizes share product and equipment awareness, patrol patterns, safety concerns, and research specific to enhancing the professionalism that goes with the tradition of being part of the bicycle patrol unit. The tradition of the bicycle patrol officer has a long history and today’s modern bicycle patrol officer uses the latest industry technology to provide the best service and protection to their communities. Posted in Mark's Articles and tagged Bicycle Patrol, Bicycle safety education, Campus patrol, Community Policing, Criminal Justice, Healthy Living, Leadership, Police, police associations, Sheriff. Bookmark the permalink.